There are over 500,000 glass photographic plates in the Harvard Plate stacks, exposed in both the northern and southern hemispheres between 1885 and 1995. This 100 year coverage is a unique resource for studying temporal variations in the universe. Because there are so many plates, our first plan was to use commercial flatbed scanners instead of the traditional scanning microdensitometer. Because that method was also too slow, we have built a specialized scanner. A Microsoft WMV format video (9.4 MB) shows the scanner in operation. We have currently performed 334,145 plate scans of 331,274 unique plates. Click on the thumbnails to the left to view the current sky coverage in equatorial and galactic coordinates. 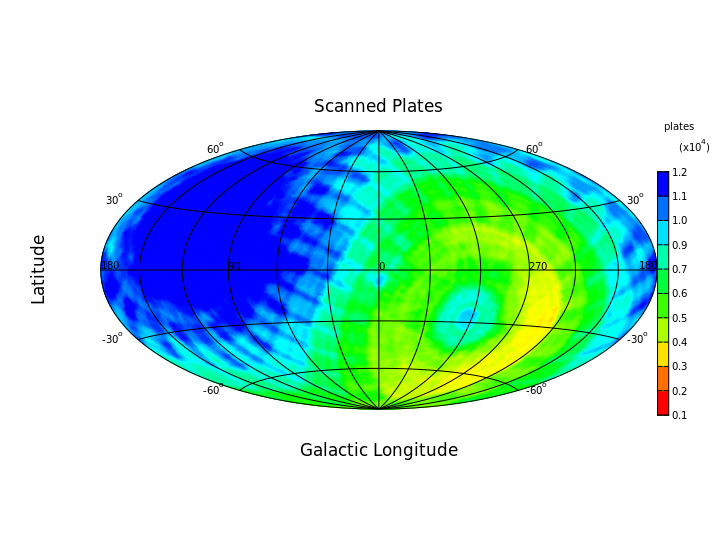 These plots are truncated to 12,000 plates at the galactic North Pole because 28,576 plates include the North Pole Sequence for photometry calibration. We have successfully performed accurate World Coordinate Systems (WCS) fits for 315,498 of these plates. Multiple exposure fitting provides us with 344,837 sets of WCS coordinates. As of June, 2008 the WCS fitting procedure procedure was upgraded to use the astrometry.net software in conjunction with Jessica Mink's WCSTools. Professor Grindlay states that the DR6 and DR7 releases have been delayed by waiting for inclusion of all Flood plates. Release of DR7 is anticipated in March 2019. In addition to building the scanner, the NSF grant enabled development of pipeline algorithms that allow photometry across a variety of emulsions and telescopes. From 291,043 plates, our photometry pipeline has generated approximately 21,847,000,000 magnitude estimates covering a span of 106 years. These magnitudes have been matched with 243,093,000 GSC2.3.2 catalog stars to generate over 54,623,000 lightcurves with at least two good points. A parallel effort required digitizing the key logbook information necessary for processing the plates. In May, 2007, the late George Champine completed imaging 79,470 pages from 813 logbooks and unbound sheets. More recently, the imaging department at the Widener library brought the total of logbook images to 81,646 pages from 842 logbooks. Volunteers locally, at the American Museum of Natural History in New York City, the Astronomical League, and the Smithsonian are now helping us transcribe these images. When combined with previous work to transcribe the card catalog and experiments with commercial transcriptions, we now have plate centers for 541,103 exposures. We have low resolution images of 299,990 plate jackets and of the ink markings from 331,087 plates. All of this digital information may be accessed from this web site. The initial set of approximately 600 scans was concentrated in the region of the sky around M44 because the photometry of this cluster is well known and the results are being used to develop the photometric pipeline. This image is of plate ir12723 of M44 taken on February 15, 1974 from Oak Ridge with the 8-inch Ross Lundin. The exposure was 15 minutes centered on 08h36m07s R.A. and +20h51m57s Declination. The next set of 1413 plates scanned were of 3c273 in order to improve the existing long-term photometry of this quasar. The set included the 1000th plate scanned by the project on October 25, 2007. 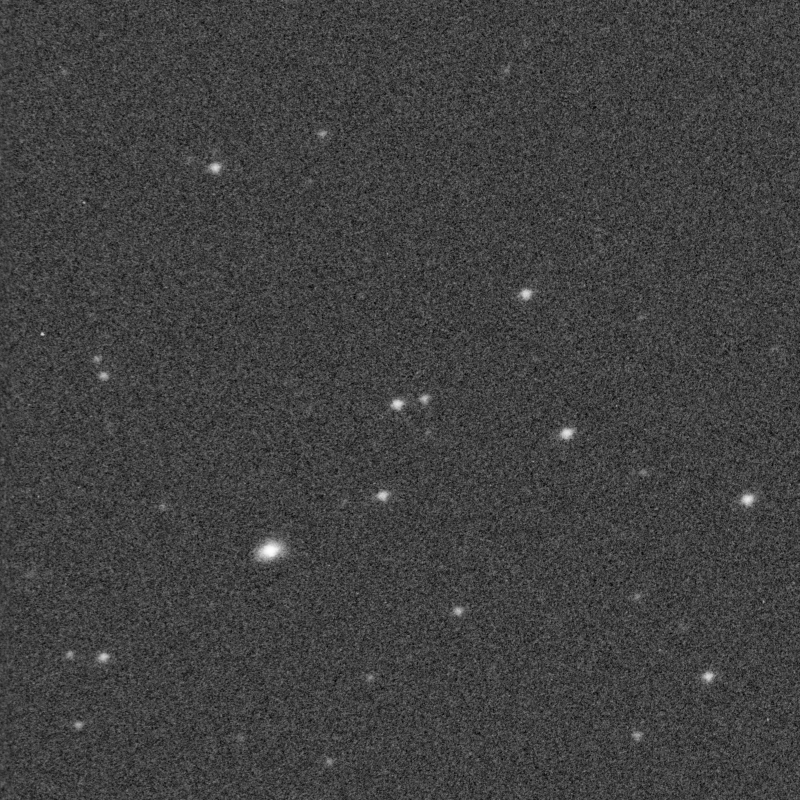 The 3c273 quasar is at the center peak of the "w" asterism in this extract from plate mf16956 taken on June 23, 1932 from Bloemfontein with a 45 minute exposure using the 10 inch Metcalf Triplet. The next set of 868 plates covers the region of Baade's window where we are testing our photometry pipeline in the region of one of the densest star fields in the Milky Way and we hope to obtain rates of novae and other burst phenomena near the center of our galaxy. This set includes the 2500th plate scanned by the project on February 28, 2008. 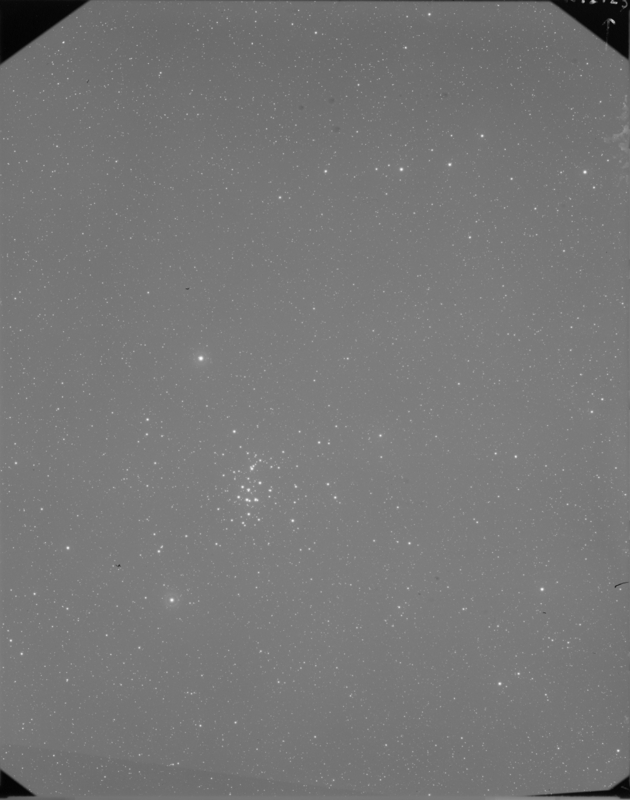 The cluster NGC6520 is near the center of this image extracted from plate rb16468 taken on August 28, 1949 from Bloemfontein with a two hour exposure using the 3 inch Ross Fecker. We scanned plates for the quasars PG0844+349, PG2130+099 and PG1211+143. Scanning for the quasar PG2130+099 included the 4000th plate scanned on January 8, 2009 and for quasar PG1211+143 included our 5000th plate scanned on April 23, 2009. 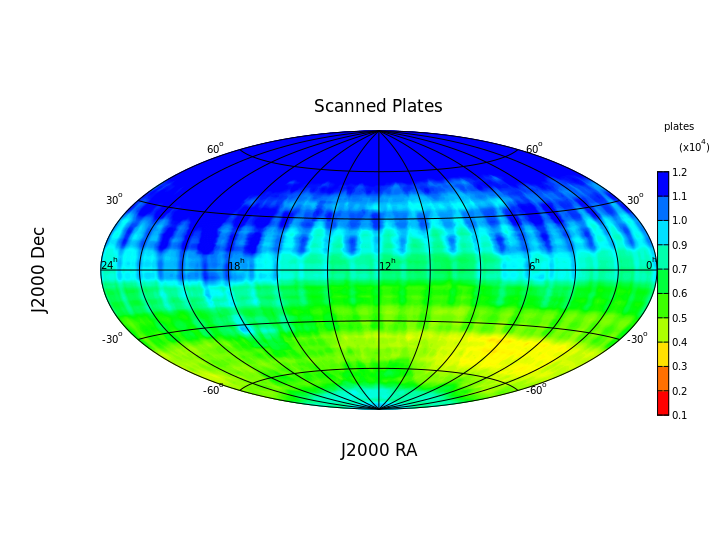 We completed scanning the field of view region of the Kepler satellite. 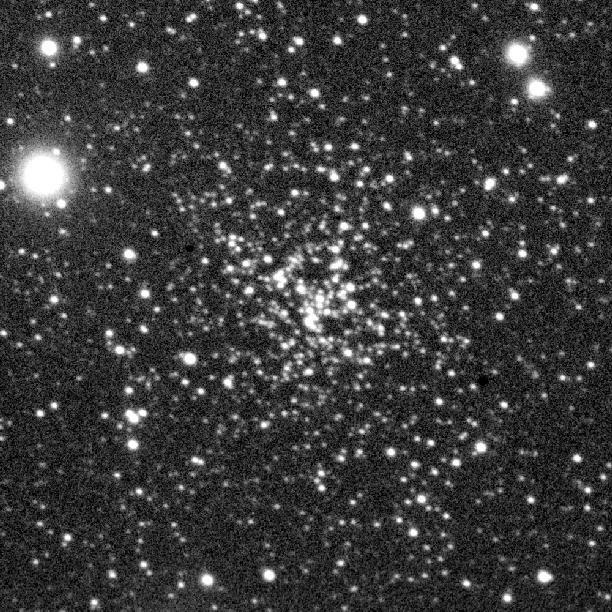 The image on the left is NGC6819 which is one of the more prominent clusters in the Kepler field. This image comes from plate mc36426 taken with the 16-inch Metcalf Doublet at Harvard, Massachusetts with a 60 minute exposure on July 4, 1949. Thanks to Dave Latham, we are using the Kepler Input Catalog to refine the colorterm processing of our photometry pipeline. From 9011 Kepler field plates, we have 731,512,000 magnitudes and 1,408,000 lightcurves with at least two good points from the 4,678,000 stars matched to the Kepler Input Catalog. The more accurate photometry in this catalog has simplified our task of identifying unusual stars. 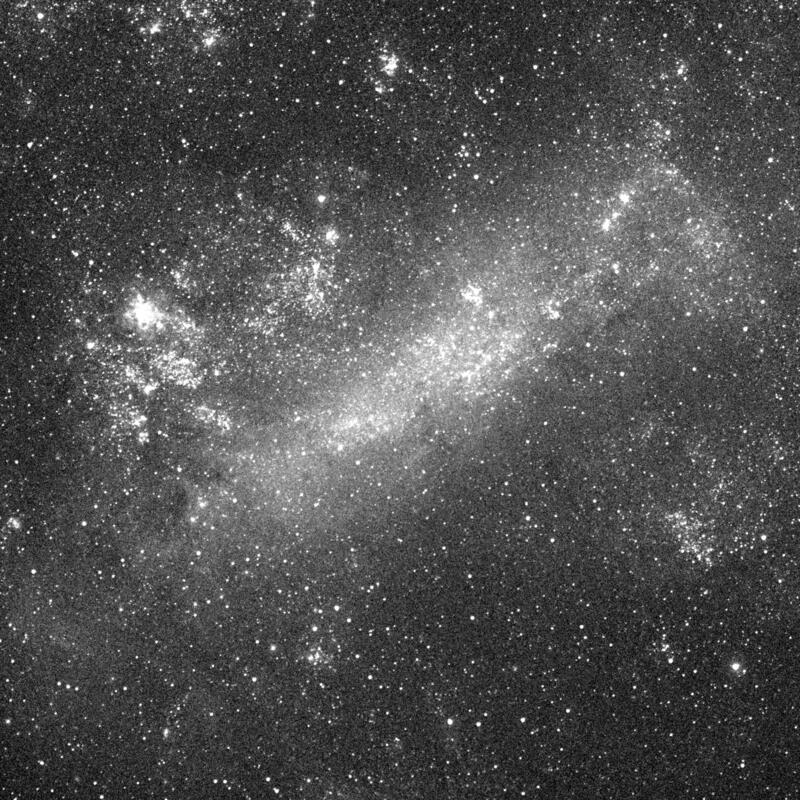 We scanned plates of the Large Magellanic Cloud. The image on the left was extracted from plate dsb00978 taken from Mt. John, New Zealand with the 0.042 m Damon South Blue patrol telescope on December 8, 1982 using a 30 minute exposure. 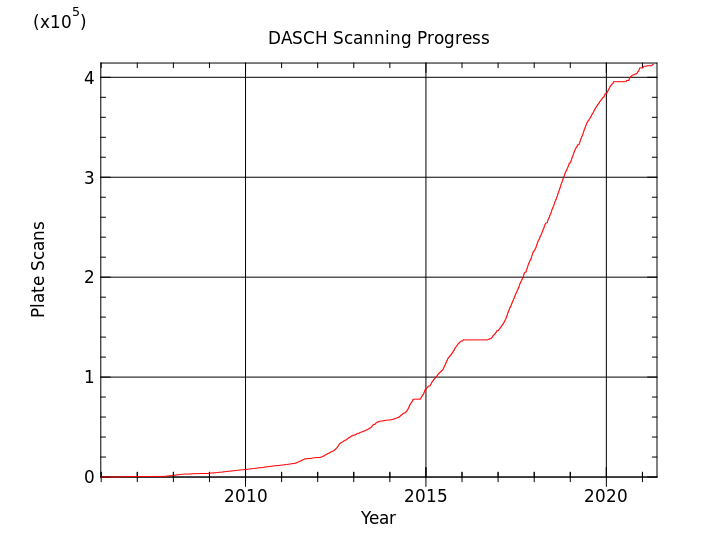 Our 10,000th DASCH plate scan occurred on July 8, 2010 while scanning in the region of the Large Magellanic Cloud. In September, we took time out from the LMC project to fill in our coverage for the Baade's window and to scan plates of Tc 1, a planetary nebula in which C60 and C70 fullerines have recently been detected. We also took time out to scan plates for interesting stars discovered with Sumin Tang's data mining algorithms. On May 19, 2011, we completed the move of our photometry pipeline to three nodes on the Odyssey cluster. We completed scanning our first batch of the large 8"x14" A series plates for the above fields . These plate scans produce 2GByte mosaics. This switch from the 8"x10" plates which make up the bulk of the collection required a number of procedural changes and slowed the scanning rate by nearly a factor of three. We scanned our 20,000th plate on January 26, 2012 after switching back to 8"x10" plates to scan some candidate stars in Scorpio. We scanned our 80,000th plate on Nov 13, 2014 following a shutdown to repair and upgrade the plate loader mechanism and control box. Our home page explains our scanning and release strategy. We are currently working on Data Release 6. We resumed scanning on September 16, 2016 after recovery from a flood. We scanned the 330,000th plate on February 28, 2019. The availability of the APASS Catalog provides us with a new source of calibration stars in the magnitude range of our plates. Release 8 of this catalog became available in December, 2014 with nearly full sky coverage. From 280,543 plates we have 20,660,000,000 magnitudes. We have matched 242,547,000 stars from the combined APASS, GSC2.3.2, and Tycho-2 catalogs to generate over 47,360,000 lightcurves with at least two good points. The combined catalog allows matching with stars missing from the APASS catalog, but for best accuracy, magnitude calibration uses only APASS magnitudes. We scanned 42 plates taken by the Palomar 5m telescope of the Cas A supernova remnant from 1951 - 1989 to facilitate a study of the expansion of optical knots in the SNR: Patnaude and Fesen (2014) A Comparison of X-ray and Optical Emission in Cassiopeia A . This was a ~half-day intrusion on our scanning schedule. 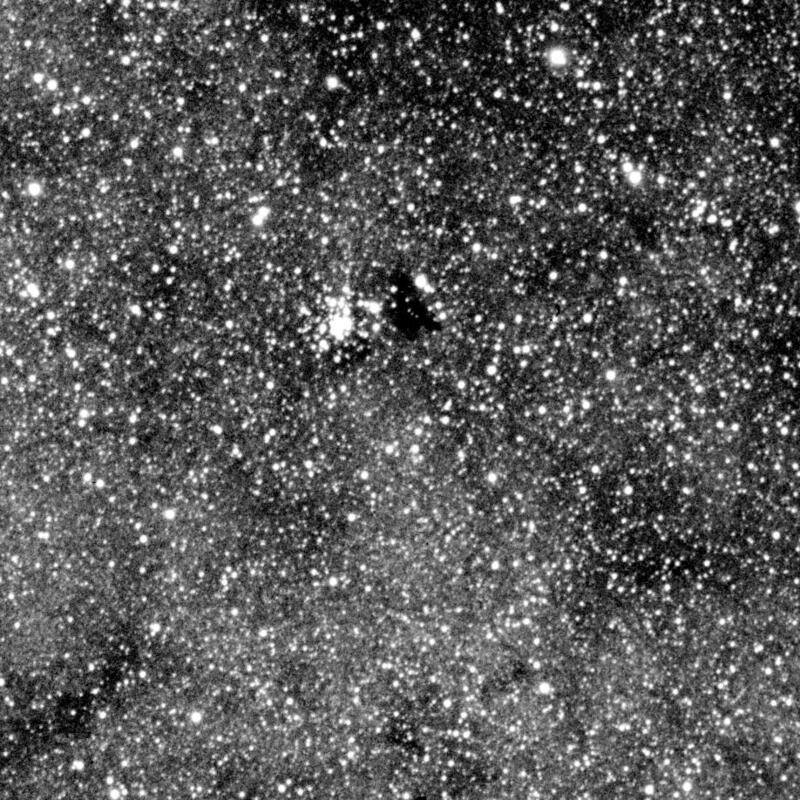 We scanned 840 plates (a 3 day effort) taken by the 40 inch reflector at Lowell Observatory from 1930 - 1951 of the planet Pluto at the request of the New Horizons mission for the Pluto Flyby. A report on the results of this effort appears in Jet Propulsion Laboratory Memorandum IOM 392R-14-003 , 30 Apr 2014. The DASCH project at Harvard is grateful for partial support from NSF grants AST-0407380, AST-0909073, and AST-1313370; which should be acknowledged in all papers making use of DASCH data. We acknowledge the one-time gift of the Cornel and Cynthia K. Sarosdy Fund for DASCH, and thank Grzegorz Pojmanski of the ASAS project for providing some of the source code on which the DASCH web-interface is based. The ongoing AAVSO Photometric All-Sky Survey (APASS) has improved DASCH photometric calibration and is funded by the Robert Martin Ayers Sciences Fund. Last updated Fri 22 Mar 2019 5:21 PM by Edward J. Los.